Digital Maximum Power Point Tracking no DC-DC conversion. All details in my Kickstarter page description including user manual , HW, SW as is a fully open source project. Re: Digital Maximum Power Point Tracking no DC-DC conversion. I don't quite understand the mechanism. 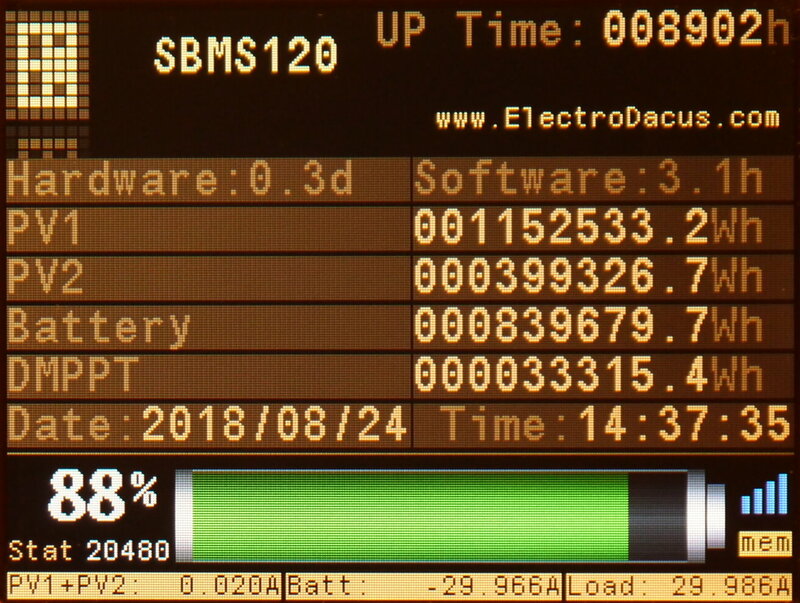 I assume the goal of MPPT is to harvest the maximum possible power from the panel and direct all of this power to the battery with minimum losses. If the MPPT point for the solar panel is, say, at 30V, and the battery is at 12V, how may it be possible to satisfy both of these voltages without a DC-to-DC converter? If you look at the DMPPT450 user manual you will find the principal of operation and what that DMPPT450 is good for. The simplified diagram will help you better understand how it works but I will try to explain here in a few words. The DMPPT450 uses as input a large PV array in my case 10kWp and there are 6 outputs where resistive heating elements are connected each with a different value and by connecting a number of this heating elements you load the PV array with one of the 32 or even 64 levels (6 outputs with different resistance say 1,2,4,8... ohm just an example get's you up to 64 levels thus the digital part). So you get the max power point but since there are 32 to 64 power levels that can be selected by changing the 6 resistive load outputs to ON or OFF the max power point tracking is digital. 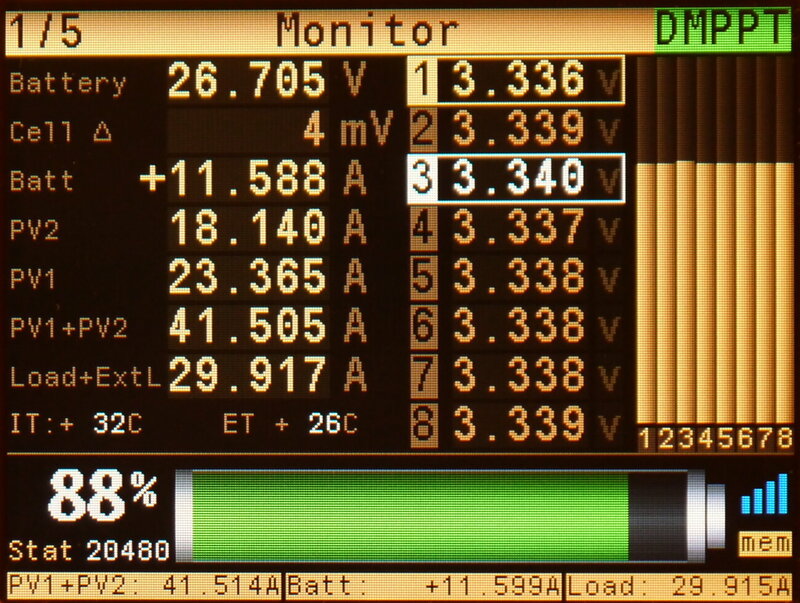 This is one of the parts of the DMPPT450 the other part is that it can divert one up to 6 of the PV inputs to the SBMS120 keeping the output to what you specified in the SBMS120 menu. 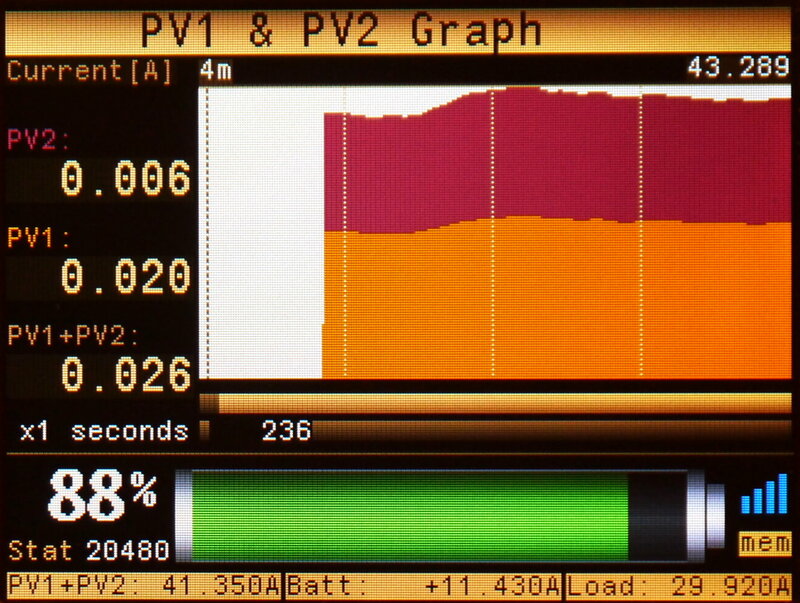 In my case I have a 24V 180Ah battery so about 5kWh and to protect the battery charge current should be keep under 50A but the 39x 260W panels over 10kWp is way more than that over 300 even 400A in ideal conditions so the DMPPT450 is able to only divert some of the 6 inputs each connected to a number of panels so that it gets as close as possible to the 50A limit set. This way in a sunny day it may only redirect 6 panels to battery charging the rest of 33 panels are used for heating with digital max power point and in case of an overcast day it can redirect all panels as long they are outputting under 50A as LiFePO4 gets priority over thermal mass storage that way battery capacity can be about 3x or even more smaller than what will normally be needed for same energy usage as battery will be fully charged even in worst overcast day with the huge PV array. My small offgrid house is a net zero energy house as all energy for electricity and heating is provided by the 10kW PV array and this is the most cost effective solution even compared to natural gas. I see. The primary goal is heating. Very interesting idea! I can't afford much of electric heating - the day is too short and the weather is too cold. Warm floor in the bathrooms is all I can do. BTW: If you use electric energy for heating the house, you can use bitcoin-mining servers instead of heating elements. All the heat goes to the room anyway, but does a useful job on its way. Not sure I mentioned but I'm in Saskatchewan just north of Regina and I doubt is much colder at your location. How cold it is or how thermally insulated the house is has nothing to do with the energy cost per unit of energy and PV heating is the most cost effective energy source. I can not just heat the air directly so the bitcoin computing devices will need to be water cooled and then use that to heat the water thermal storage or concrete as heating the air will make the house way to hot. There is huge amounts of energy during the short days when is sunny and that energy needs to be put in thermal storage as air has almost no thermal storage capacity by volume is more than 3000 times worse than water. So same energy to increase 1 liter of water by one degree Celsius 1.16Wh can heat 3 cubic meters of air by same 1 degree Celsius. By that token, a straight on/off switch is digital, which is strictly true but not the normal use of the word. The output of a DAC would be digital by that usage, but it's not what we normally call it and is a bit misleading IMO. I think the term you are looking for is 'quantized'. There are only 32 power levels so the typical Gaussian curve looks fairly digital when compared to the analog look of one made using a DC-DC converter and while that is also digital the DAC resolution is way higher but more importantly there is also a filter inductors and capacitors are part of the output so it is as analog as it gets on the output. And while I understand Quantized is a good description I have a hard time explaining what DMPPT450 is without adding the Quantized word that is less commonly used compared to Digital. Also MPPT is strongly associated with DC-DC converters even if the name has nothing to do with that and many complained about the use of MPPT even if it describes perfectly what the device is doing. Glad you like the display graphic The more important point is that using PV energy is the lowest cost form of energy and this includes natural gas so heating with solar PV is the most economical. The heating + electricity bill for my house is about $42/month about half of that amount for each. 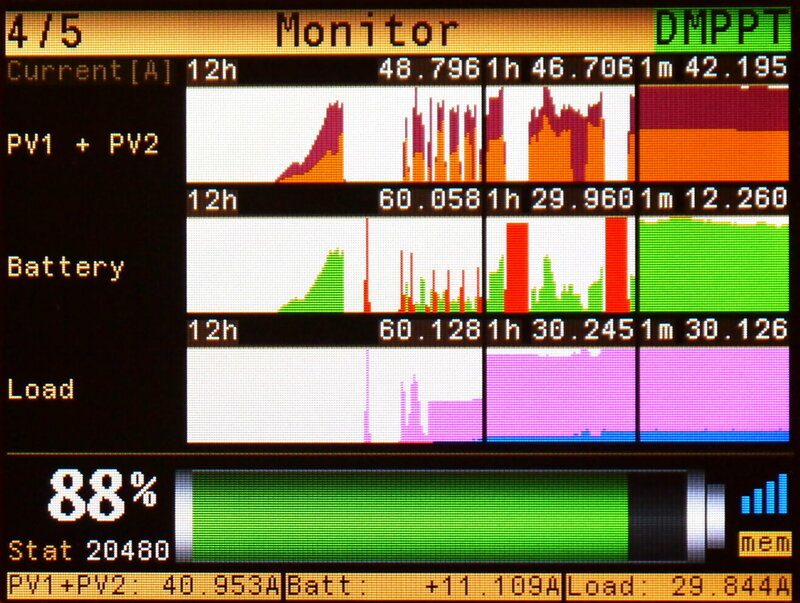 That display is what you will see in a web browser when connected to the SBMS that acts as an access point. 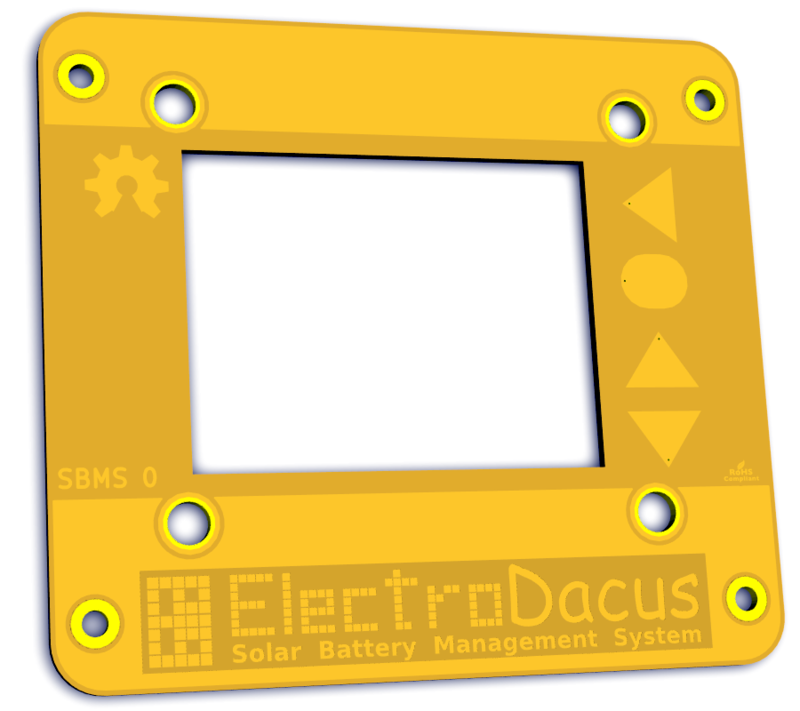 The electrons may be cheap, but the TCO has to include the panels, batteries, converters, etc. For your statement to be true you need to specify the payback period for all that up-front infrastructure (and ongoing maintenance costs of, for instance, the batteries). I'm north of Edmonton. In the middle of the winter, we really get only about 3 hours of sun (on a sunny day that is), and it's on average only 5 sunny days in December. Worse yet, since the Sun is low it must penetrate thicker layers of atmosphere. Thus the energy per sq. m. is about half of what I get in Summer. Temperature dips below -40 few times a year. If I could heat anything with my 6kW array, it would not be bigger than a doghouse. I use natural gas (relatively cheap) and wood (free). Wish you good luck with your project. All of that is included. The cost of the entire equipment was $15k and all equipment is designed to last at least 30 years except for the 5kWh LiFePO4 battery that costed $2k and should last at least 15 possibly 20 years as I measured for last year 0.9% degradation so less than 1% per year. ($15000 / 30 years) / 12 months = $42 figure I quote and there is no ongoing maintenance or anything else. What this amount does not include is my labor to install all this equipment. Heating and electricity are fairly integrated but if I where to separate the cost is will be about half for each so $21 for heating spread over all 12 months of the year even if heating season is 7 months here in Saskatchewan Canada and the same $21 for electricity where I use 120kWh/month so about 17.5 cent/kWh but there is no connection fee or any other fee. According to pvwatts Edmonton gets about 30% less energy than Regina so you will need a 30% larger PV array assuming same house as mine will be located there and maybe slightly larger thermal mass storage that means less than 30% for the total investment of $15k let say $20k as it is a round number and that means $56 per month for both heating and electricity and while more expensive it will still be by far the lowest cost compared to grid electricity plus natural gas and this assumes connections are already made as the connections alone will cost that or more. Note that $ means USD as is more universal for others CAD is fairly low at this time. I've heard there's a village somewhere close to Calgary where they built a huge underground reservoir. It is very well insulated. They heat it all summer long with their panels. They then use the water to heat their houses during winter. Sounds very reasonable. You only need till March. Your controllers would be ideal for such applications. That is called seasonal thermal storage and not cost effective when compared to much smaller thermal storage + PV panels as PV panel energy is o inexpensive over-sizing the thermal storage to this level (months instead of days) is not cost effective. I considered seasonal storage and it is a very bad solution even in Northern Europe where there is much less sun in winter than Calgary. I have seen a solar PV powered house in Germany designed with seasonal thermal storage and it was a fairly bad idea and very expensive in therms of cost amortization. The idea was good when house was designed and PV panels where about 10x more expensive than now. Unfortunately to many people do proper cost analysis before starting projects like this as there is no unknown and everything can be calculated fairly accurately before doing any costly investment. There's such a rediculous thing as PV thermal? I thought solar thermal was always direct. I thought solar thermal was always direct. Not when it is -40. Thermal solar is more expensive than PV solar heating and that is the reason thermal solar is no longer a good idea. For more detailed comparison see page 5 in my presentation. I'm not familiar with this kind of devices but I must say the GUI is impressive. Do you use an existing library? So just download the SBMS user manual and you will find link to this HTML file if that is what you want or on last page of the manual there are link to all HW and SW files if you where interested in the SBMS GUI as that was also build by me from scratch but runs on an STM32F373 and works with a 320x240 4-wire SPI interface. I was talking about the embedded GUI on the QVGA screen. Well done, that must have been quite a task to code this graphics from scratch. IMO/E coding the GUI is only half the battle - having the creative vision of the end result before you begin is just as important. There was nothing available to work for me and I needed to start having a fast LCD driver for 4 wire SPI as all those available where very slow and inefficient for what I needed. In any case do not use the files from that video as there are a few more improvements in the latest SBMS code so use that instead.